There is no cheese too fragrant, nor beer too sour, for his discerning palate. Although cheese and beer rank at the top of his food loves, the culinary joys of his childhood rank highly too—Toast Hawaii, Griessschnitte, and his favourite cookie of all time, Bärentatzen. More on Switzerland's favourite Guetzli, as reported by Watson, here. So, for his birthday I decided to combine his love of cheese (which fortunately extends to cream cheese) and Bärentatzen, and the result is this super easy, no-bake, insanely delicious and for some, nostalgic, cheesecake. Line the bottom of a 20 cm / 8 inch round springform pan with parchment paper. Measure out 250 g Bärentatzen into a large bowl. Using a fork or your hands (easiest), break up the cookies into fine crumbs. Add the melted butter and stir until it comes together. Press evenly into the bottom of the pan. In a separate large bowl whip the cream cheese and sugar until smooth and fluffy. Add the vanilla. 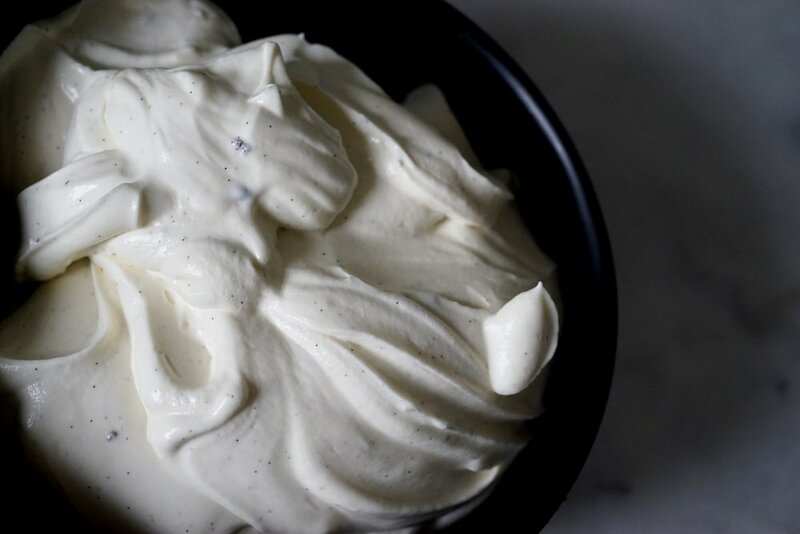 In another bowl, whip the cream to soft peaks, then fold this gently into the cream cheese. Spread the cream mixture over the cookie base, then cover with plastic wrap (press this directly onto the surface) and let cool in the fridge for at least 2 hours. Before serving you can smooth out the top of the cake. Dip an offset spatula in hot water, then swipe across the cake's surface. You can probably use other cookies to make the base. Bärentatzen are quite soft, so don't need much butter to hold them together. Crumblier cookies probably require a bit more butter, or even something like chocolate, to keep the base solid. If desired, you could flavour the cream cheese mixture with a shot of booze. I used a tablespoon of vanilla-infused rum in this version.